Getting the right answer of the people, for the people and by people were Soma, Susan, Cheryl, Anne, Lisa, Kara and Minoru. A number of you asked last week why there is a statue of Abraham Lincoln in Manchester. The bronze statue by George Grey Barnard was originally meant to stand outside the Houses of Parliament to mark 100 years of unbroken peace that had existed since 1814 between Britain and the USA. Once the statue had been finished Lincoln's son, Robert, intervened and said he didn't like the way his father's hands had been placed over his stomach and it became known as the 'stomach ache statue'. An alternative statue that was destined for Liverpool was instead sent to London. Rather than swapping the two statues around this one became homeless until members of the Manchester Art Gallery committee raised the money to bring this statue to the city. They stated it was a fitting place for it to be erected as Lincoln himself in 1863 acknowledged the support of the Manchester people working in the cotton mills during the time that cotton exports were blocked during the American Civil War. A version of this speech is engraved onto the plinth when it was relocated in 1986 but the term 'working men' was replaced with 'working people'. Onto this week and we are all at sea. Pictured is not a full-scale rescue mission but a Tuesday night practice session in Seahouses Harbour in Northumberland. Located here is one of the 238 RNLI stations in the UK. Once it was up and running funding became a constant issue. Voluntary donations had dropped to such a low level that it had to accept subsidies from the government to continue. These subsidies stopped in 1869 when it was decided that the government intervention that came with the money was interfering with the running of the service. 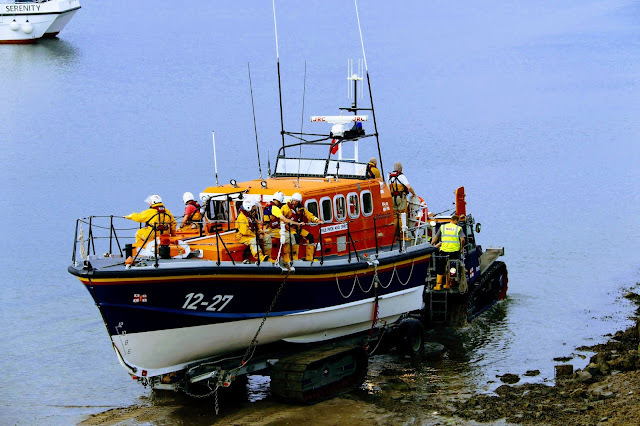 Today the RNLI receives no funding from the government but relies on public donations, appeals and legacies in order raise the money needed for the £176.5m that was required in 2017. What does 'RNLI' stand for? We were joined last week by Sara and some of her favourite things – a Venus fly trap light art, Interlaken grapes and a perennial sunflower. Soma has been camping in the High Sierra mountains. The gate to the secret garden was found by Susan. It was a windy day for Cheryl on Hastings Pier. Lisa has been spotting meteors in the desert. A trip to London for Kara meant visits to Stamford Bridge and Les Misérables. In Japan Minoru found a park full of red spider lilies. Finally, Jesh has taken a moment to remember a holiday in Italy. If you want to join in with this week's Sunday Snap then add your link to the linky below. Any theme is allowed. It doesn't have to be published today as you have until 23.55 on Friday 12th October 2018 to join in. Grab my badge below for your blog post. Just make sure it is your photo and you hold the copyright for it. Thank you for filling us in about the Abraham Lincoln statue. So interesting! Hi! Nice capture. The Lincoln's story is very interesting. Thanks for sharing.